IPL 2019: Rishabh Pant is surely impressing the selectors and making a strong case for himself to make it to the World Cup squad. 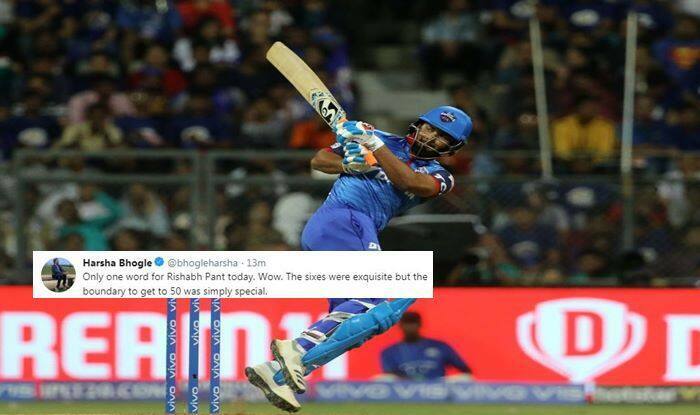 Young Rishabh Pant set the stage on fire as he smashed the fastest fifty by any player against Mumbai Indians and the second fastest fifty for Delhi Capitals. He brought up his fifty in merely 18 balls. During his blitz, he hit four sixes and six fours for his fifty. There was one shot that grabbed our attention, it came off Jasprit Bumrah which makes it even more special. Pant played an incredible ‘helicopter’ shot over mid-wicket and it went sailing into the crowd for a six. ‘Helicopter’ shot is a signature hit of former India captain MS Dhoni. Pant looked in ominous touch right from the time he walked into the middle. After a couple of dot balls, he got into his elements and then made a mockery of the Mumbai Indians bowling. He was finding strange places to hit boundaries, he also hit a couple of insane one-hand sixers. He finally remained unbeaten on 78* off 28 balls as he powered Delhi Capitals to 213/6. For a change, Bumrah too went for runs as Pant took him on. Bumrah finished with figures of 40 for a solitary wicket from his stipulated four overs.